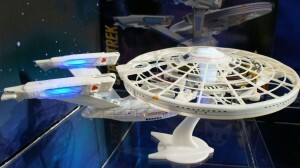 The latest drone creation of the year showed off by Toy Fair Spin Master and it is a USS Enterprise quad-copter. It is not able to travel at a high speed, but it would be introduced on the 50th anniversary of Star Trek. The “Spin Master” is supposedly well-known for its famous series of Air Hogs RC vehicles. The company has previous experience for manufacturing fictional spacecraft in the form of drone. A quad-copter Millennium Falcon and X-Wing Star-fighter were also introduced in the last years Star Wars “Force Friday”. The company has showed an excellent level of care in its design. The rotors and packed in a lightweight and durable plastic casing made to simulate the saucer section of the NCC-1701-A. It is familiar to those who watched first six Star Trek films. In order to function, the saucer casing provides an open framework to making the drone ship. Most of the important features are included and displayed on the top front side, such as Bridge on the top, windows with sharp edge, the name of ship and its serial number. The lightweight foam with light-up warp nacelles is being used for the drive section of the Starship. The sound unit also provides a variety of sound effects such as warp sounds. Importantly, the Star Trek quad-copter was available at the retail price of 120 U.S dollars in the month of September 2015.